Although the desert may seem like an inhospitable place for plant life, several unusual plants have adapted to the desert environment. 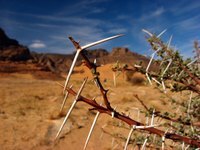 Rather than having long branches, stems or leaves that require an abundance of moisture, many desert plants have developed thorns instead. These thorns conserve water and keep pesky animals from trying to drink their water. For optimal growth in a home garden, they require lots of sun and limited water. The cactus is the most famous desert plant, with thorns that range from tiny spikes to long spines. Cacti have small bumps called areoles that produces either a spine, flower or fruit, depending on the environmental conditions at the time. Their squat stature allows them to store moisture inside, without excess outer tissue that would allow water to escape. Gardeners can easily grow small cacti in the garden or in sunny indoor spots beside a window. They need full sun and well-drained soil, with plenty of time to dry out between lukewarm waterings. Prickly poppies of the Argemone genus are desert flowers whose stems are covered in thorns. Most are white or lavender in color and thrive in the southern United States. The sepals just beneath the flower petals have prickles, while the leaves are spiny to keep animals at bay. They also have long roots that are able to draw water from deep underground. They make dramatic additions to gardens when placed in full sunshine with lots of space to establish roots and grow bigger. The whitethorn acacia, or acacia constricta, are thorny shrubs that produce round, yellow flowers in the spring and again in the late summer. Long thorns dot their branches. They grow mostly in the southwestern U.S. and Mexico, where they can survive for several decades. In the wild, they thrive in extreme summer heat as well as below freezing temperatures in winter, sometimes going months without precipitation, according to a feature article by Corey L. Gucker at the Forest Service website. In a garden, they can survive a moderate or warm climate and are drought tolerant. What Kind of Plants Grow in the Desert?